Finding Home Farms is just as beautiful as it sounds, really. The brand, blog and IG of the same name were created after the Putnam family decided to embrace a different way of life. Their home and sugar farm are located in the Hudson Valley of New York where wine making and the well-known novel, "The Legend of Sleepy Hollow" also reside. While Laura's husband, Dana, is in charge of the sugar making, Laura has found her niche in the area of home decor and writing. In fact, she recently published a book entitled, "DIY Rustic Modern Metal Crafts." Her home is where she expresses herself and gets her inspiration for her DIY projects. At first glance, you wouldn't know that the Putnam's farmhouse was a builder-grade home. This is because in 2010 the Putnam's decided to renovate the home to better suit their needs and decorating style. Additions like the white farmhouse kitchen, crown moulding, built-ins and a number of rustic elements are just some of the changes exacted to this home. The icing on the cake is the sugar shed out back. An adorable structure designed to fulfill a functional purpose but also to coordinate perfectly with the family residence. This classic white farmhouse kitchen features Shaker-style cabinetry, light stone countertops and rich hardwood flooring. The rustic wood of the dining table contrasts beautifully against the dark black chairs. The focal point of the great room is a black and white fireplace surrounded by lots of light giving windows. An old door creates unique backdrop for a collection of vintage plates in the dining room. The walls of this library have been decorated with a rich floral wallpaper to create a cozy atmosphere. A wall of built-in bookshelves provide the opportunity to display a collection of books and favorite decorative items. Out back is the sugar shed where Dana Putnam makes their "Finding Home" maple syrup. 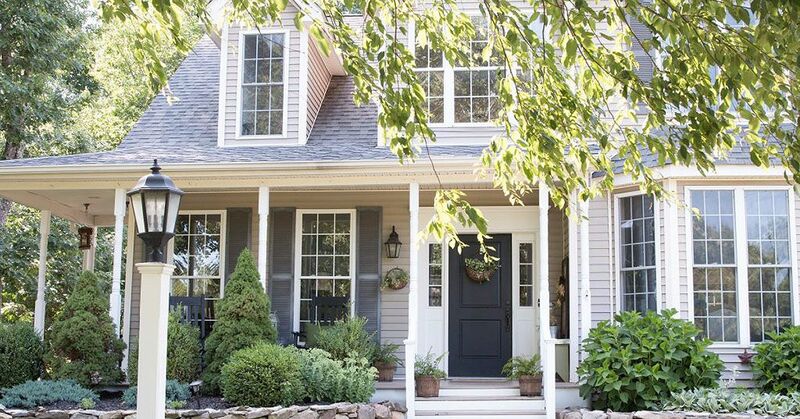 Does this home have you dreaming of creating a quiet farmhouse retreat of your own? Then share the inspiration with your friends on Facebook.